Most real estate investors are aware they can use their self-directed IRA to invest in real estate. I have quite a few posts on this topic. If you are familiar with any of these prior posts you probably know I am not a fan of the self-directed IRA unless you are dealing with ROTH funds or you plan to buy and hold one property for an extended period. Outside of these two situations I believe the risks of investing through a self-directed IRA do not justify the risks given the IRS current interest in these transactions. My preference is, and will remain, the Qualified Retirement Plan (Profit Sharing Plan or solo 401k) which offers the same, and many more, benefits over the self-directed IRA. Rest assured this is not another post on why you should avoid self-directed IRA, you can read these prior posts if you are in doubt, but a strategy wherein you can partner with your QRP to buy real estate. Consider John who would like to purchase a house for $200,000. John has a QRP with 150k and personal funds of $100,000. John could purchase the house in his name with financing, or he could partner with his QRP to buy the house. 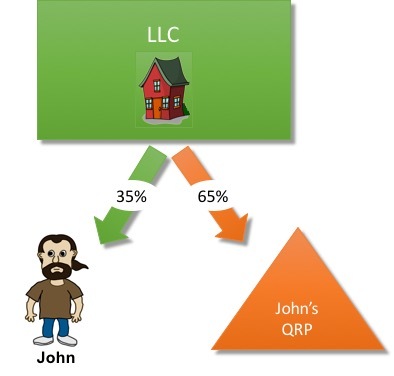 To partner with his QRP John and his QRP would need to form a LLC and divide the ownership proportional to the contributions from each member, i.e., if John contributes $70,000, and his QRP contributes $130,000 then the ownership would be divided as follows: John 35% and his QRP 65%. If you are familiar with LLCs and their creation, then you should know profits will be split based upon ownership percentages. If John’s LLC generates $20,000, then John will receive $7,000 and $13,000 will be distributed to his QRP. From a tax standpoint, John will have taxable income of $7,000 and the QRP will not have any taxable income from its $13,000 in earnings. Straightforward right. How about the losses? If you recall, real estate is depreciated over 27.5 or 39 years depending on its characterization. Depreciation is often referred to as a paper loss because it can be used to offset your real estate income. In my example, the 200k house (175k allocated to depreciable structures and $25,000 to land) will generate approximately $6,400 per year in depreciation. John’s will receive $2,240 of the depreciation thereby reducing his income from $7,000 to $4,760, and his QRP will capture the remaining $4,160 depreciation. Depreciation allocated to the QRP does not benefit John because his QRP does not pay tax on its portion of the income. Partnering with your QRP can produce some desirable tax benefits and opportunities to increase your overall investment portfolio. However, this is not something you should set up without the assistance of our firm or another qualified advisor experienced in the tax aspects of LLCs and QRPs. If you would like to explore the creation of this structure, please call my office to schedule a consultation. Would having the QRP invested in the same LLC as the owner of the QRP be against IRS rules for self directed IRAs? The caveat I was taught is “the IRA cannot benefit from you personally, or you cannot benefit personally from the IRA”. Not too close for comfort? No provided the LLC was setup with the QRP and the owner becoming members at the same time. Once the LLC is created then any further contributions would be considered a prohibited transaction. This is why it is imperative you fully fund the LLC with plenty of cash to handle your real estate transactions. You can only move money in once. Interesting post, I had no idea that could be done. Just to clarify, you can do the tax advantaged strategy with a solo 401k but not a SDIRA? I unfortunately rolled most of my IRA funds into Roth IRA’s, which cannot be rolled into Roth 401ks. My new funds are going into Solo 401ks but that’s not much.